Hello residents of MotK! 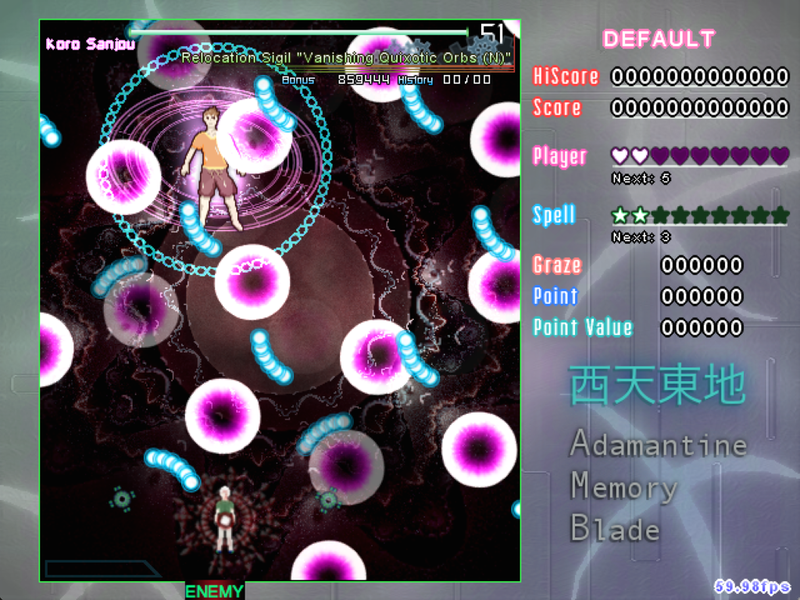 This is Sparen, now embarking on my own series of 2D Vertical Scrolling Touhou parodies Danmaku shooters! 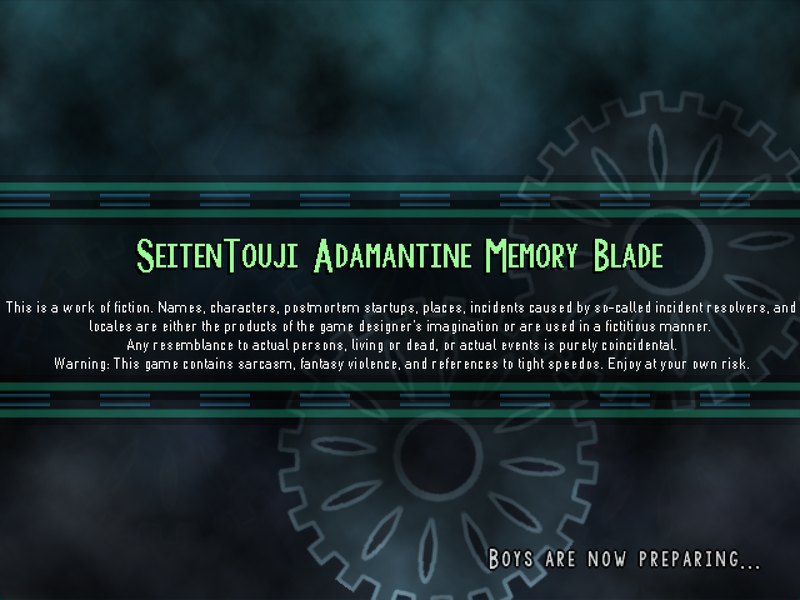 The first game in the new series, which I am calling SeitenTouji, is Adamantine Memory Blade, and was released on Q3 2016 Q3 2017 Q1 2018 May 24, 2018 July 13, 2018, with a follow up update on Feb 23, 2019! This game stars a cast completely independent from those of the Touhou Series (it is meant to be similar to Len'en in that it is obviously based on Touhou but does not actually contain Touhou Characters) in a strange uncharted world. The game stars Teiki on his quest to understand the new world he is in. Work has been done, my crew has been (partially) assembled, and the next set of system and implementation hurdles has been overcome! I hope to have a three stage demo ready by the end of summer, although whether or not that will happen is still to be determined at a later time. As of today, I am finally firing GhoulMage and am now actively looking for a composer who does not take five months to come up with a single track. I cannot pay you, of course, and you'll have to deal with a number of unreasonable composing and arranging requests. And yes, this project was on hiatus for three months or so and still technically is, but I'm trying, on some level, to revive it. Your requirements might be more reasonable than they sound. Of course, though, I probably won't be able to pull off a satisfactory job either. I can do 2 or 3 tracks. but my problem is the lack of internet, so I'm always connected 1 time at the week. Can do stage, boss or title tracks. Thanks for the offer but since I'm aiming for something very different from Touhou style for the majority of the game, I don't know how well you'd be able to pull it off. Also, you have your own game to worry about. Hooray, for the hiatus has sort of become less dramatic, as there is some sort of progress being made...ish. Anyways, still looking for someone willing to compose Stage 4 and Stage 5 stage tracks, as well as Final Stage and boss tracks. If nobody responds, the music quality will be the same as in the video - crapton of distortion guitar with no real melody except for ear cringe. Yes, the game is already half a year off-schedule. Yes I'm going to end up producing all of the remaining assets. Yes Lunatic Mode is super easy while Easy Mode makes UFO look like a cakewalk. But I have a little more free time, and having moved from Skype to Discord means that I'm getting more suggestions and feedback than before. Resource creation has been going rather well, and enough music tracks have been made that I don't feel like it's hopeless. Current tagged version is v0.43. Stage 3 demo is still in reach. Just need a few days of time and inspiration and not-marathoning-anime to get it done. On a side note, I'm still phasing out unoriginal resources, but the shot sheet cannot go due to my inexperience with making my own. Critical bugs found in the system will be back-ported to my Seiran script once the RaNGE 16 contest results have been announced. Currently working on unlockables - omake skits and ExAttack practice attacks need to be locked until they are, well... unlocked. One more spell and a bunch of graphical replacements, and I should be ready to release a three stage demo. The colors are so fantasy! I really like it. 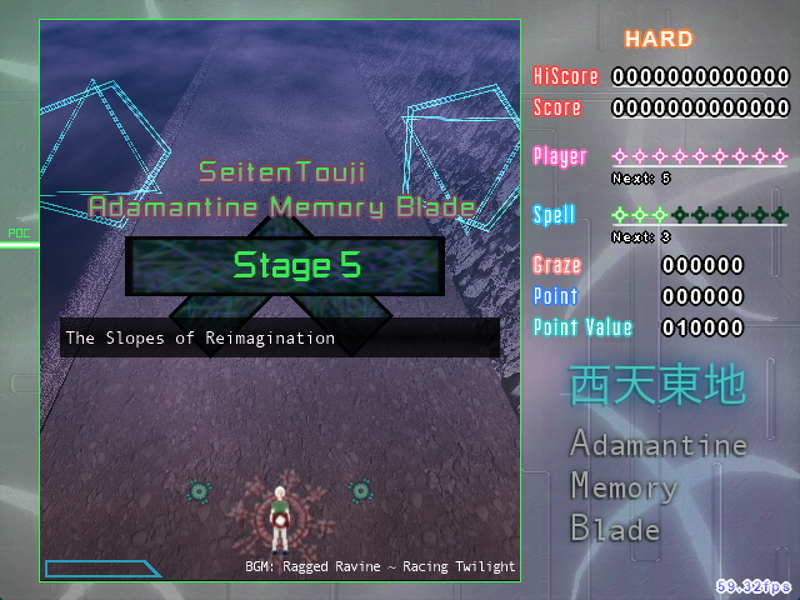 I am greatly pleased to announce that Stage 3's danmaku has been completed! Soon this project will finally go into release candidate mode as improvements are made to various components of the game. Heavy difficulty balancing will begin shortly, as well as new and relevant content and upgrades/replacements of temporary sprite sheets. Although I cannot specify an exact date for the three-stage demo, it will actually come out this year, so that's good news. I will update this individual post as necessary until the release of the three stage demo. UPDATE April 12, 2016: We are one sprite sheet replacement away from entering the final stage of beta-testing. Please wait warmly for up to two months as I procrastinate on that last sprite sheet. UPDATE April 16, 2016: We are now entering the pre-release beta-testing period. Please wait warmly for bugs to be found. I am now actively looking for beta testers. The game is ready for testing, and it would be nice to have more than three people trying to find issues. Cuz I need to stop procrastinating on the beta testing and actually test my game and stuff instead of playing 12 hours of Factorio a day. I've decided that I need to actually do stuff to get this project moving, so tomorrow (June 11, 2016), I plan to have a development stream similar to the ones used for Ephemeral Unnatural Balance. The public will be able to see how the project is progressing and will be able to give feedback as well. Additional stretch goals are italicized. In the past few days I somehow revived the project and blazed through the rest of Stage 4, which is now done. v0.54 is open to Beta Testers, and hopefully the rest of the development will kick into high gear and actually happen now! I am pleased to announce that there is now a Discord Server for development of this project, among others. However, finding people to test to see if Stage Practice actually works seems to be problematic because almost none of the testers I currently have seem to want to test, so I am looking for active testers who are actually willing to play the game every now and then. Given the past history of development, this means a few times a month. If you're interested, send me a PM. Preferably, I'm looking for those with development experience and/or those who have played Touhou for quite a while. All dodging skill levels are welcomed - there are four difficulties to test and all of them are horribly unbalanced. As a general update, I am pleased to announce that as of Version 0.60, the project is now proceeding at a steady and respectable pace. If all goes well in terms of resource allocation (sprites for Stages 4 through X are currently either placeholders or nonexistent, still need cutin and additional graphics for extra stage boss), it is estimated that Stage 6 will be completed in under one month, with the Extra Stage taking around 1-2 months. If this schedule continues as such, by the time all of the postgame content, Overdrives, Last Words, etc. are complete and the game is ready for official release, it will be Q2 or Q3 2017. To those who have been following this project, thank you very much for your patience, and I assure you that it will be worth the wait. I am pleased to announce the completion of Stage 6. Endgame content such as the ending, omakes, overdrives, Extra Stage, and Last Words will begin production shortly. 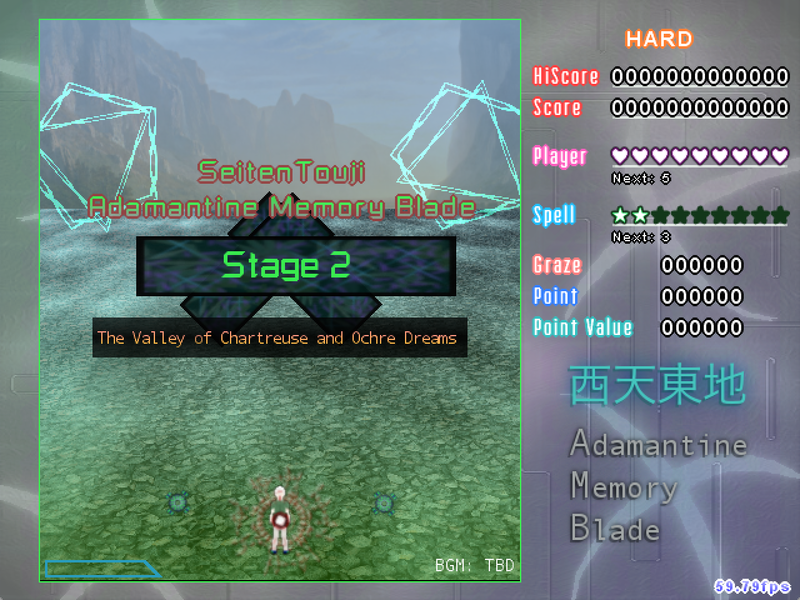 As the development cycle nears its end, I will need Easy and Lunatic level testers to provide feedback on those two difficulties, as well as comparative difficulties of the Extra Stage, Overdrives, and Last Words. I would very much like the last words to actually be capturable, after all. As of today, work on the Extra Stage has officially kicked into high gear. I am still looking for a replacement sprite sheet animator since Ck Crash left the team, and I am still looking for play testers. Hello RaNGE! This is Sparen of Iria, pleased to provide an update in regards to SeitenTouji. As of yesterday, the project has finally hit one of its most anticipated milestones - the complete replacement of gore & ExPorygon's AllStar Shotsheet! This means that all of the bullet graphics in the game are original - the only parts of the shot sheet that I didn't make are ExPorygon's bullet delay graphics. 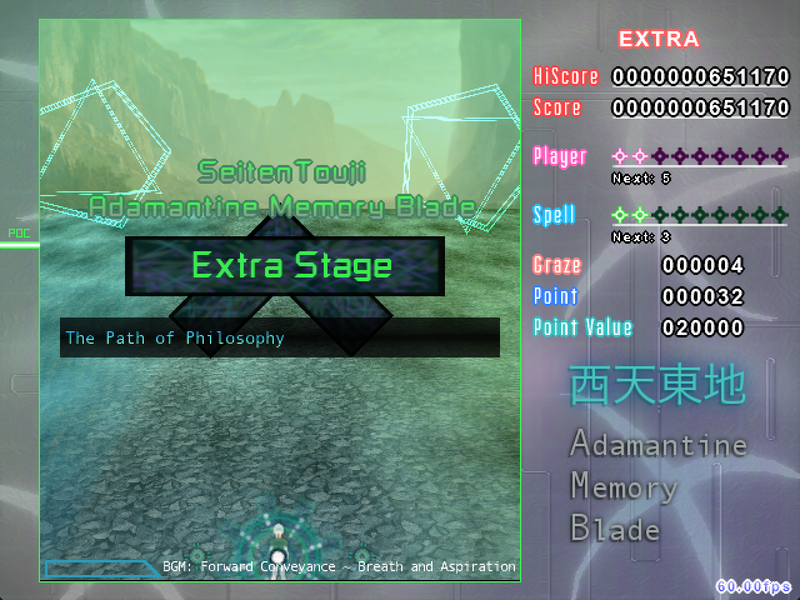 Additionally, work on the Extra Stage has paused in order to handle various other issues throughout the game. Over the course of the past few months, the robustness of the system has increased significantly, and my next project (constant-based enemy graphic locking) will make stages easier for me to make by making the color of stage enemies determined using constants rather than their index in the sprite sheet. This will also allow for me to create many new enemy colors and types in a scalable fashion, which will hopefully be a major boon for the seitenTouji project. I am pleased to announce that the Extra Stage has been completed and has been provided to the testers for balancing so that it's actually possible to clear for an average Normal-Hard difficulty player. Over the coming weeks I hope to fix bugs, add postgame content (omakes, overdrives, last words), and balance the heck out of the game. Right now the hard deadline for release is likely going to be the end of May 2018, though whether or not that will be the actual release date is still up in the air. Thank you all for you continued support. I will be searching for Lunatic level players in the near future for balancing overdrives and last words. Nice! How long has it been since we actually had such a full game release here? 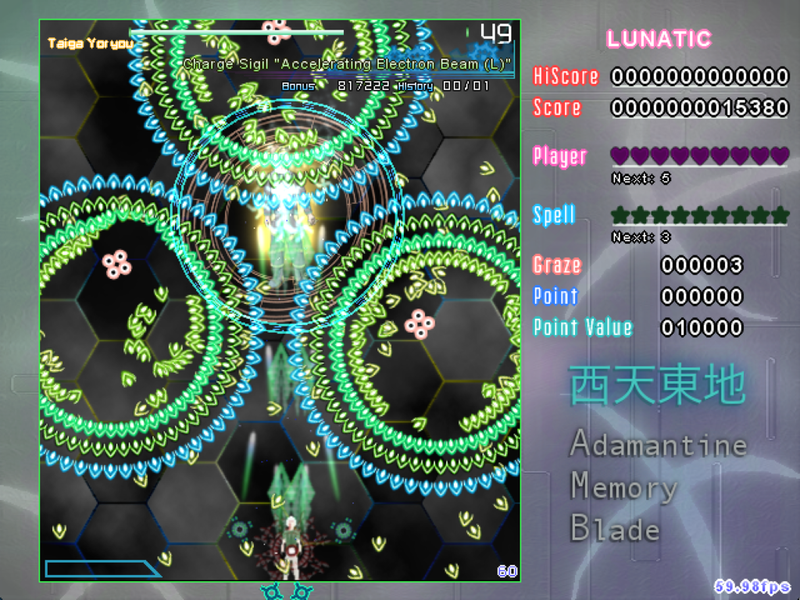 I've never cleared an extra stage in a Touhou game, so I can't judge the difficulty very well. Same goes for Hard and Lunatic modes. I'm pretty sure that with the current state of Extra, around half of it would probably feel like Phantasm difficulty rather than plain 'ol Extra. Version 0.71 just sent to secondary testers. Overdrives all complete. Release date may not be adhered to depending on how quickly I can replace copyrighted assets (ZUN's SFX) and animate all the sprites. As usual, if you want to playtest, the instant invite to the Discord server is at https://discord.gg/vXpr7Mw. Currently looking for testers familiar with Extra Stages, Lunatic difficulty, or Easy difficulty to balance out the extremes. Version 0.72 was just sent out to secondary testers. 8 days until release! From here on out it's just replacing sound effects and getting sprites animated. Look forward to the full game (-last words, unfortunately) release! As a general update, another project was thrown my way and the bare minimum I want to get done before release (pixel sprites for idle animations - Stages 4, 5, and 6 Bosses) looks like it may not be possible. That in addition to a very hectic schedule means that I may end up shifting the release date over by a week, as it is no longer logistically possible to release on May 24. If the release date is postponed, it will be noted in a post here, on my website, and in the thread topic. I apologize for those who have been looking forwards to this game.